Each member of your association wants to feel that they are important and valued. As the organization grows, it becomes more difficult to maintain that personal connection with each member. The good news is that with modern membership and business management systems that connect and share data, you can maintain a personal level of interaction. The committees they serve on and their position. With better information, you and the entire staff can show genuine interest without having to pretend you know more than you do. If you are still using separate systems to manage events, dues, donations and social interaction, member information is fragmented. Without data consolidation there is no way to provide association staff with a complete picture of member activities and your constituents don’t get the personal attention that they deserve. Shared member profiles across the organization for personal engagement. Connection of social channel interactions with member records for complete data. Tracking of all interactions with each member. Alerts to support immediate responses when appropriate. Learn how BroadPoint helps associations streamline processes and connect systems to better serve their members. 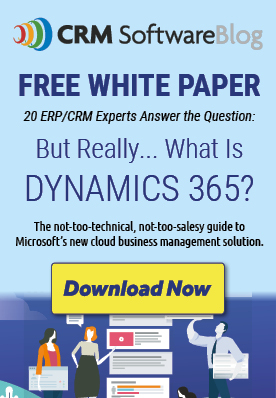 The Better CRM: Microsoft Dynamics 365 or Salesforce? Forrester study says Dynamics 365. Very true. Automation is definitely key with any decent CRM. Good to read about your blog, Challenges which you explain its true but CRM itself not a solution for manufacturing companies.